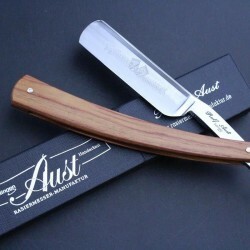 Ralf Aust is an unusual phenomenon in this modern age - a master artisan who single handed produces all the razors he sells in the age old tradition using traditional tools and methods. 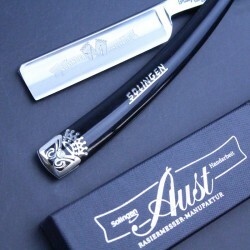 Ralf Aust is an unusual phenomenon in this modern age - a master artisan who single handed produces all the razors he sells in the age old tradition using traditional tools and methods. He started learning his trade at age 15, taking over the business from his father when he was 50. He purchases the blanks from a factory in Solingen, and each blank goes through a process of 60 to 80 individual steps all taking about a week to complete. 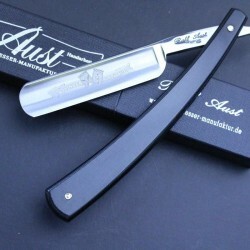 No razor leaves the factory without Ralf being happy that it meets his exacting standards. 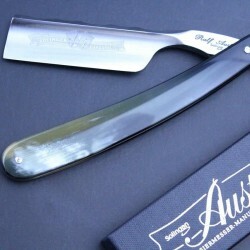 The result is an individually produced high quality product that will last a lifetime.